“The increment observed in the last decades contradicts the reduced growth that typically occurs as cambial age increases, especially considering the widespread growth decline and dieback that various Mediterranean ecosystems have recently experienced,” ” the researchers wrote in a recently published paper. Accurately determining Italus’ age was a tough challenge, mainly because the inside of the tree – the section where the oldest growth rings were suposed to be – had completely deteriorated for some reason. Researchers reported that this inner-most section of the tree was like dust, noting that they had never seen anything like it before, so dating its trunk rings wasn’t going to work. 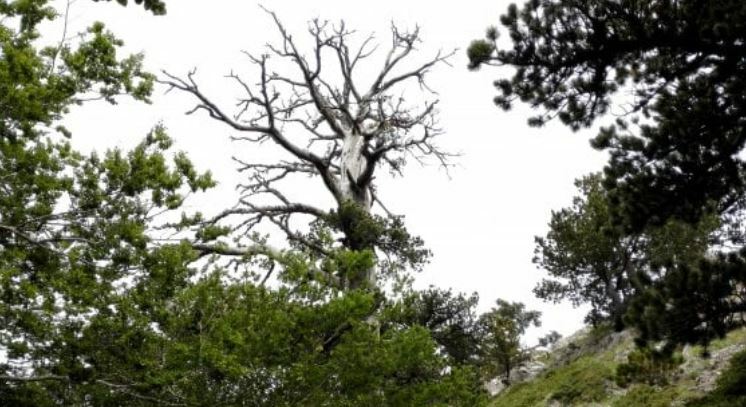 Luckily, due to the location of the Heldreich’s pine – on a steep rocky slope with exposed dolomitic bedrock – its ancient roots were partially exposed, so researchers could use radiocarbon dating on them to accurately determine the age of the tree. Like the trunk, roots also produce annual rings. After analyzing the collected samples, researchers concluded that Italus was at least 1,230 years old, which makes it almost two centuries older than the previous oldest known tree in Europe – a 1,075 year old pine tree in Greece. Scientists believe that the tree’s remote location played a big part in its survival. The steep rocky slope is believed to have protected Italus from both logging activity in the area as well as wildfires. However, it’s important to note that while the area that Italus was discovered in is home to thousands of other Heldreich’s pines, most of them are only between 500 and 600 years old, with only three other specimens believed to be over 1,000 years old. The researchers conclude that despite its degraded canopy, Italus is still growing and could potentially live for centuries more.